Envelops lips in a fragrant treat using the Hurraw! 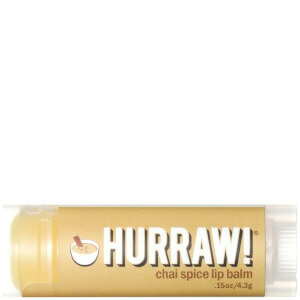 Chai Spice Lip Balm; an ultra-hydrating formula that cares for skin using premium organic, vegan and raw ingredients. Effortlessly gliding over lips, the creamy lip balm is enriched with a skin-loving blend of Sweet Almond and Jojoba Seed Oil, which delivers instant and long-lasting hydration. 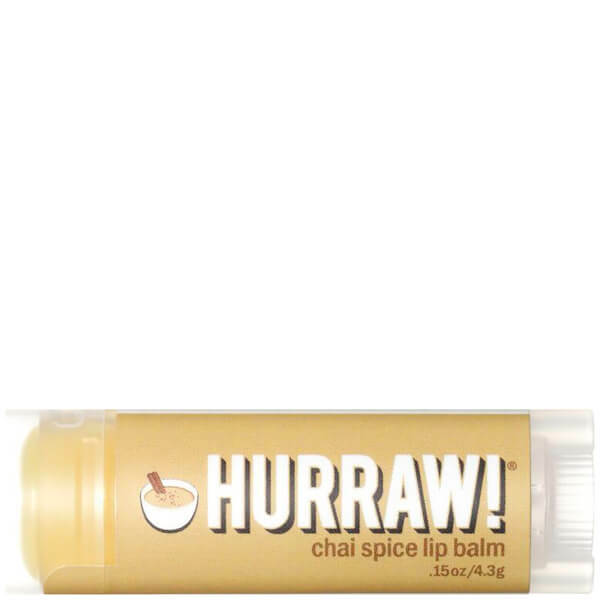 The lip balm is inspired by Hurraw!’s favourite beverage, chai tea and boasts a blend of Black Pepper, Cinnamon, Clove, Anise and Vanilla, which lend the hydrator a rich spiciness. Lips are left thoroughly nourished and completely kissable in one simple swipe. Prunus Amygdalus Dulcis (Sweet Almond) Oil, +Euphorbia Cerifera (Candelilla) Wax, *Cocos Nucifera (Coconut) Oil, *Simmondsia Chinensis (Jojoba) Seed Oil, *Theobroma Cacao (Cocoa) Seed Butter, *Ricinus Communis (Castor) Seed Oil, Olea Europaea (Olive) Fruit Oil, Organic Flavors, Elettaria Cardamomum (Cardamom) Oil, Tocopherols (Sunflower). *Organic & Cold Pressed. Smells like Christmas and really hydrates the lips- love it!